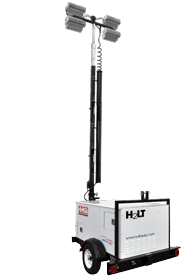 Canada Pump and Power is a distributor for Multiquip light tower and generator products. Multiquip offers three series of high quality Mobile Light Towers to tackle your demanding requirements. Years of Construction Industry field experience have forged these units into trusted hard working tools. The LT Series is ideal for fleet and general use, the MLT Modular Tower Series provide versatility and multiple power packages, and the H2LT Series are environmentally friendly, quiet and extremely efficient. The Multiquip LT-12D Light Tower is designed as a value added source of dependable lighting and AC Power generation. The four 1000W light fixtures provide superior illumination, and convenient external AC Power is available for job site support. It is the perfect choice for construction, industrial and special event sites.